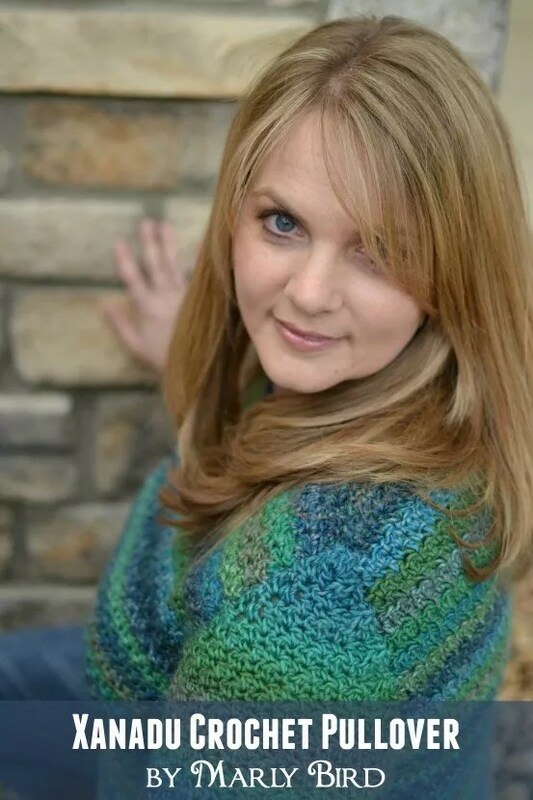 This sweater was one I crocheted for the magazine, Crochet Today, and is now a pattern that Red Heart posted on their website because they loved it as much as I do 🙂 When I made the Xanadu Crochet Pullover it was the first time that I had ever used Red Heart Boutique Treasures yarn and I thought it was just wonderful! The color changes were spectacular, the feel of it in my hands and on the body was lovely and the price point is one that won’t bust the bank! In the Marly Bird YouTube video, I approached the tutorial differently in that I don’t actually crochet along with you. I walk you through the body of a sleeve and sleeve cap. Then, I offer you a mission to make all the pieces of the sweater and join me later (actually, over the next few weeks) when I show you how to seam a sweater and how to sew on ribbing to the body of the sweater in future tutorials. 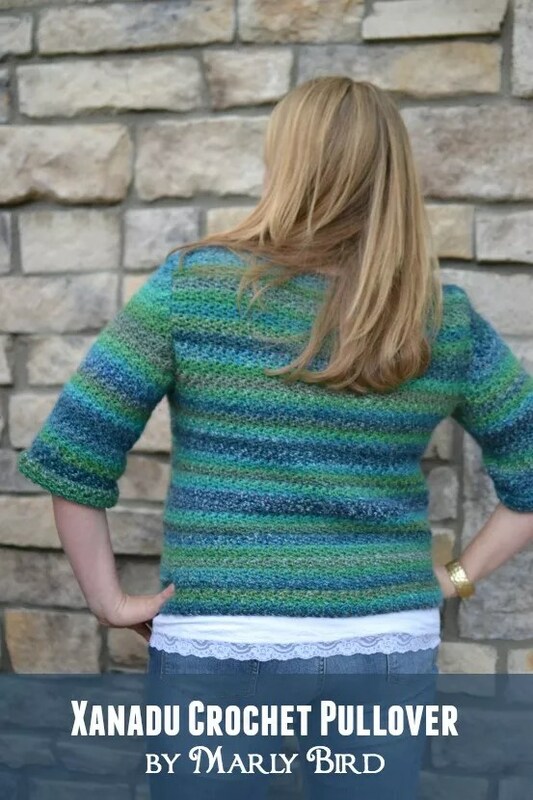 Now, you too can make this cute crochet pullover with the free crochet pattern and the free video tutorial taught by me, Marly Bird you will have nothing but success. 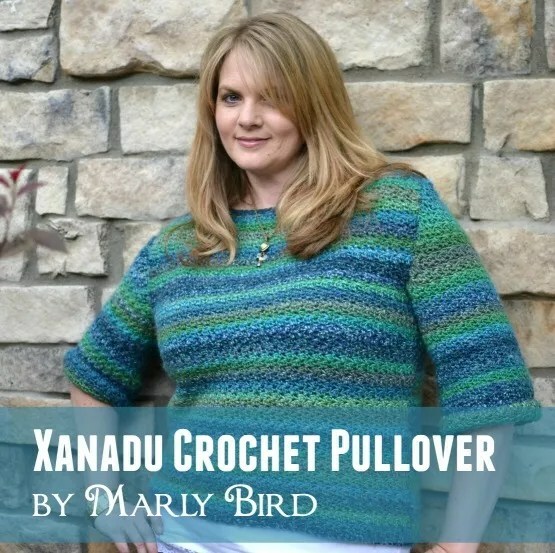 In this video I walk you through how to read the Xanadu pattern, how and why you shape for the armholes and the shoulders, and talk you through how to make the sleeves. After you complete these parts of the sweater look for the How to Seam a Sweater Video and the How to Join Ribbing with a Whip Stitch Video (coming soon) to finish the entire sweater. In the PDF of the pattern, row 2-3 instructions are blocked by other text. Can you post these instructions? RedHeart has not responded and chat room on RedHeart has said they can not comment. HELP!